"Ichigo Mahimaro Encore" takes us back to the world of the five Ichigo girls! As with many "slice of life" anime titles, the story doesn’t really have any real place in the time line. It could happen pretty much at any time during the girls childhood. However, with this series it’s all about comedy and cuteness. So does it have both of them once again? You bet! From watching Miu have an "after-life" experience, to the girls trying to figure out whom of which can be considered best friends, to gags that seem to come out of nowhere. Each episode showcases a different style of idea or situation for the girls. Just about all of the episodes revolve around Miu (who is the one responsible for 90% of the gags again), which may in turn disappoint fans of the other girls. Still, each of them is shown in good equality with her, and the gags and laughs that you have come to expect from the anime, are all present and accounted for. In fact I would go on record of saying that episode 2 of Encore, is by far one of the funniest I have seen for the entire anime. Now since none of the stories really ever have an overall goal in mind (this version being no exception), viewers who couldn’t stand the series for it’s cuteness factor or pointless story, should avoid this one as well. Since nothing new has been added to the series (other than a tweak in the art department), and sadly there are only 2 episodes with this version. Overall though, fans of the anime won't be dissapointed! The OVA manages to capture the charm of the show to a "T." So grab a nice bucket of popcorn, site back, relax and get ready for some good cute fun! For me this was one of the hardest things to get use to. For some odd reason "DAUME" decided to tweak the art style for the characters in this version, and now all the girls look slightly older and much more...round? It would almost appear that they have been packing away a dozen doughnuts everyday since we saw them last. Other than that however it all stays the same. Backgrounds remain pretty washed out, the color is still soft, and the character design remains cute and fluffy. If you can make it past the new looking character design, then the art style shouldn't hinder your enjoyment. As expected we get a new opening and ending theme, made solely for this OVA. Once again the opening is cute with a high beat party pitch with the actual voice cast singing. The ending is much more calmer sincere pitched. The series' strong point in the audio department has never really been with the actual music, as most of it can be considered nothing if not "appropriate." Where the series shines in this department is with it's voice cast. All the Japanese voice actors have returned to fill their roles to each character, and pull it off great! I especially enjoyed the part where Miu inmates the other girls, you can tell that Fumiko Orikasa (her voice actress) is a very talented individual, because she does a good job of actually sounding like them! The girls retain their cuteness, charm and innocent ways. From Nobue's lazy carefree attitude, to Matsuri's timid personality. It really feels like not a moment has past since we last left them. No new characters have been added, and the cast remains as small as it ever did, and thus only shows the actual five girls. Which might disappoint some viewers. It shouldn't be much of a problem since this version is only 2 episodes long. The cast doesn't really have a large amount of depth to them, but they do compliment each other very well! Bottomline, they remain the same characters you have grown to either love or hate. Fans of the series will no doubt be pleased though! "Ichigo Mashimaro Encore" remains true to the series! Art style aside, it's the same kind of charm and comedy fans of the anime have grown to love over the years. If you didn't care for the anime before, then this one won't make you change your mind. If you're a fan of the series, or just like a good amount of cuteness to go along with your viewings. Then I highly recommend this version. 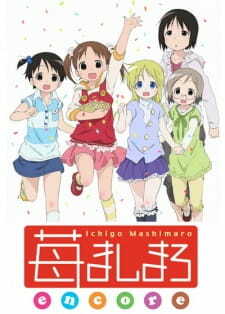 Ichigo Mashimaro may not do anything new with its cute comedy style, but it does indeed do it right! Well with only two episodes to comment on, it's hard not to talk much about the story. It kinda melds together with the OVA and they came in the same DVD set that my sister bought for us to watch. The first episode had Miu taking a trip to the afterlife, which was in some ways hysterical, and in others pretty discomforting. Miu's one-liners were hilarious ("Taxi!! "), but lifting up Ana's skirt was NOT. It's a common theme with the show, very funny and cute stuff with really disturbing lolicon crap added too. Just look the other way...these episodes felt more original and unique than the OVA did though. Art was done differently, just didn't look as sharp or well done as the original or OVA. Ranked it lower because of that. Voice acting was fine, but the theme songs weren't that great. Lower score because of that too. Characters were themselves and then some, really kept it true to the original series. On this part, they will not disappoint!! It was enjoyable, but you have to sit through the lolicon stuff that makes you really uncomfortable. It's a shame too,the entire series would be so cute and still very funny without all of that crap. Still a decent "2nd season" to the show and worth watching if you liked the first. The jokes are funny, just try and ignore the loli stuff and you'll be fine. Worth a watch for sure!!! I have been a big fan of Ichigo Mashimaro for it's subtle humor and laid back style. I found the first OAV to be very funny and enjoyable. I was somewhat disappointed by the change in art work from the original. Over all though I was happy with this episode and I am looking forward to the second one.